Inflation drops for 8th consecutive time – NBS report – Royal Times of Nigeria. 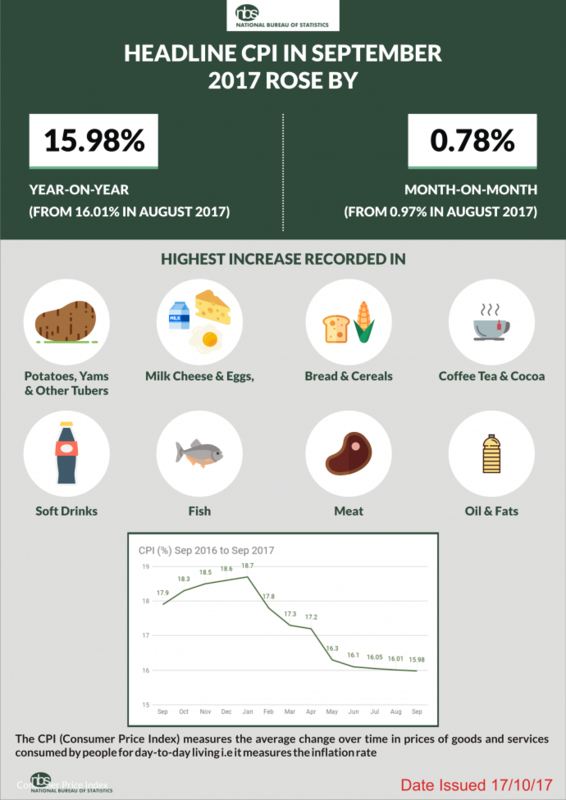 Recent data released by the National Bureau of Statistics (NBS) on Tuesday, shows that Nigeria’s inflation rate dropped to 15.98% from 16.01% for the month of September. It is the eighth consecutive time the country’s inflation rate is dropping in 2017. However, all major food sub-indexes increased by 20.32 percent year-on-year in September, an increase from the 20.25 percent recorded in August. The report said, “This (the year-on-year inflation rate drop) was 0.03 percent points lower than the rate recorded in August (16.01) percent making it the eighth consecutive decline in the rate of headline year on year inflation since January 2017,”. “Increases were recorded in all COICOP divisions that yield the Headline Index. “On a month-on-month basis, the headline index increased by 0.78 percent in September 2017, 0.19 percent points lower from the rate of 0.97 percent recorded in August. “The percentage change in the average composite CPI for the twelve-month period ending in September 2017 over the average of the CPI for the previous twelve-month period was 17.17 percent, showing 0.16 percent point lower from 17.33 percent recorded in August 2017. “The Urban index rose by 16.18 percent (year-on-year) in September2017, up by 0.05 percent point from 16.13 percent recorded in August and the Rural index increased by 15.81 percent in September down from 15.91 percent in August. “On a month-on-month basis, the urban index rose by 0.84 percent in September 2017, down from 0.99 percent recorded in August, while the rural index rose by 0.74 percent in September 2017, down from 0.95 percent in August. “The corresponding twelve-month year-on-year average percentage change for the urban index decreased from 18.15 percent in August to 17.87 percent in September, while the corresponding rural inflation rate in September was 16.52 percent compared to 16.58 percent recorded in August 2017. “The rise in the index was caused by increases in prices of potatoes, yams and other tubers, milk cheese and eggs, bread and cereals, coffee tea and cocoa, soft drinks, fish, meat and oil and fats.